Extinct – This stage describes a volcano that is not likely to erupt in the near future if ever. Many volcanoes in this category haven’t been active for a long time and are now starting to show signs of decline, looking more like a passive hill than a powerful mountain that could explode at any moment. Unfortunately, many people fall into this category. They’ve given up on their dreams, are going through the motions in life with their talents and skills showing signs of atrophy, eroding away due to lack of use. Dormant – A volcano in this category is also described as inactive. Whilst they aren’t erupting at present, below the surface there may be a lot of activity going on and they could explode at any moment. People in this category may not look as though they are firing on all cylinders at present, but at least they are preparing to do so. Perhaps they’re studying or being mentored, preparing themselves for the next stage of life. They may have clear goals and are focused on doing the important background work to build momentum towards them. They’re winning the important private battles of discipline, hard work and character development that lead to public victories in the future. 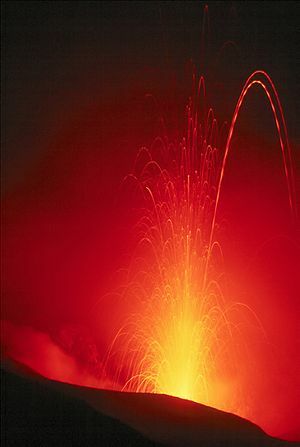 Active – An active volcano is what makes the news. They’re a magnificent sight, with lava, ash, smoke and steam spewing forth with unstoppable power. A person in this category is also an impressive sight. They’re on top of their game, with well-honed skills, recognised expertise in their field and a body of work that demands attention. All of the momentum built during their dormant stage has burst through, leading to successful outcomes that are admired by others. I believe that it’s possible for virtually everyone to get to the active stage and would encourage you to aspire to be the best you can be. If you’ve given up on your dreams and have become extinct, it’s not too late to get back in the game and start setting realistic goals that will start building the momentum required to eventually explode into life, much to the amazement of those observing you. Which stage are you currently in and what are you going to do to go to the next level or maintain your momentum? I’m sure that you’re not extinct Debbie. I know I am “Dormant” but also “Active”, because I often like to “reserve” my energy and passion until I have an outlet to express it. Sometimes I also need to study 1st before I can express myself.